The Sidewalk Ballet: From inhabitat.com — Santiago Calatrava's Gorgeous Oriente Station "Looks Lighter Than Air"
Santiago Calatrava's Gorgeous Oriente Station "Looks Lighter Than Air"
When's the last time you were in a major city's public transit center? Odds are you didn't depart feeling weightless and more in tune with nature. If the churning crowds and dismal interior didn't leave you gasping for air, it's likely that the smell of trash and vehicle emissions did. 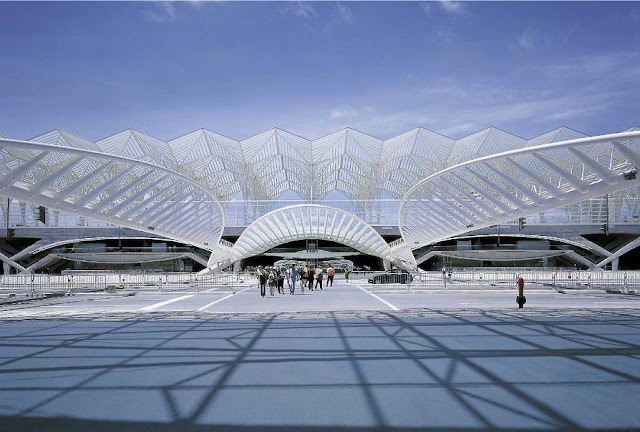 That's not the feeling designer Santiago Calatrava wanted people to take home after passing through the Portugese “Oriente Station” in the city of Lisbon, so he created a beautiful daylit building topped with a leaf-like canopy that looks lighter than air.